Design floral fantasy has a floral motive set in a central channel with coordinating floral orb finials. Options are floral fantasy reeded or floral fantasy plain. 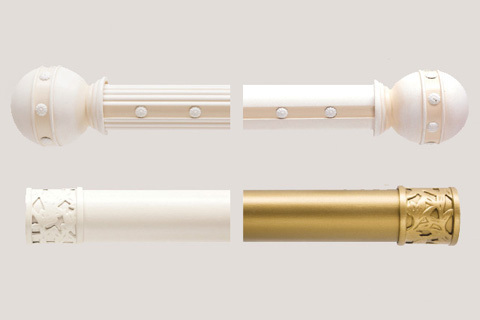 Design plain charm is a plain pole painted in a single colour and fitted with filigree end caps. Floral fantasy and plain charm are painted in standard or specified colours. Shown all are rosette holdbacks and holdback arms. All part of our accessories range.